Home In previous issues Young-horse stars, or GP stars? Young-horse stars, or GP stars? Analysis by Christopher Hector: I started going to Warendorf and writing about the Bundeschampionate back in 1999. At the time there was a tendency to suggest that the winners never went on to successfully compete in the ‘big sport’. This just wasn’t true, as any examination of the results – particularly in the five- and six-year-old dressage classes – would show. The three- and four-year-old riding classes, less so, but still with a significant number of winners that went on to Grand Prix. Taking a trip back in time, at the first Bundeschampionate to be held in Warendorf, in 1994, the finalists in the five-year-old class contained a wealth of Grand Prix talent – while the class was won by Alabaster (Akzent II - Waleska x Wen- depunkt) who did not go on, the third placegetter, Livijno (Lysander - Golf- dame x Graphit) was a superstar with Rudolf Zeilinger – third at the World Cup final of 2001 before he was sold for mega- money to Dr Bechtolsheimer and disappeared! 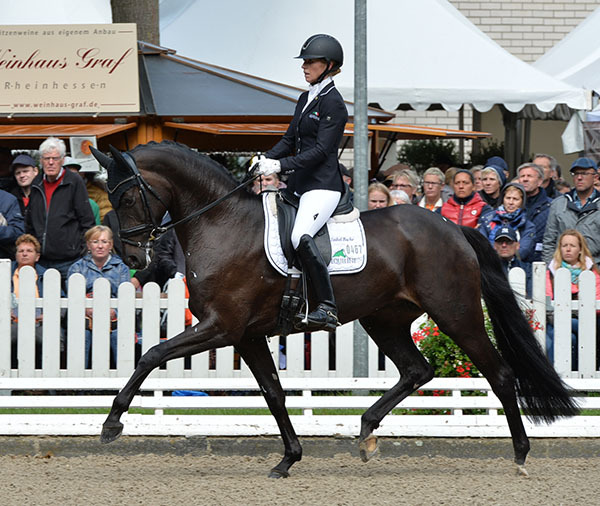 At the time, good judges regarded Livijno as the best GP horse to have left Germany! Ninth place to Chacomo (Calypso I - Paranka x Marmor) who went on to represent Germany in the gold medal winning team at the Sydney 2000 Olympic Games, and 13th to FBW Kennedy (Tiro - Katy x Karat), a star with Lone Jörgensen (DEN) and Robert Dover (USA). Wow!